He was educated at Harrow and graduated from Christ Church, Oxford in 1980 where he read History & Economics. He joined Framlington Fund Managers as Manager of the Continental European Pension Fund for 2 years, working with Anthony Milford. 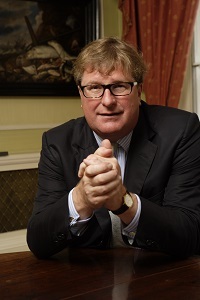 He subsequently joined Baring Asset Management in 1985 to run their Continental European Pension Fund and European Growth Trust before founding Odey Asset Management in 1991. In 2008 Crispin successfully anticipated the credit crunch. That year his return was 54.8%. With two offices in Mayfair, and sites in Guernsey, Switzerland and New York the company has now more than 100 staff and runs assets of $13.5 billion. Crispin is married to Nichola Pease and they have two sons and a daughter. Crispin is a keen and enthusiastic shot, but also enjoys quieter pursuits such as golf, fishing and tennis. He has had a pork sausage named after him by a neighbour!